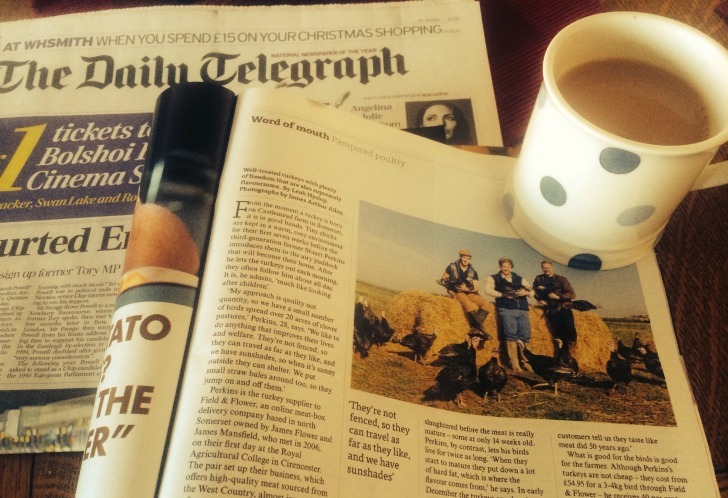 If there’s one thing we recommend you do today, it’s to buy The Telegraph and read the brilliantly written article by Leah Hyslop about the work that we do with our free-range poultry farmer Stuart, at Castlemead in Somerset. It’s not surprising we’re talking all things turkey, but the provenance of our Christmas birds, alongside the exceptional animal welfare and high quality meat that we deliver through working with Stuart, is something we’re incredibly proud of, so it’s really exciting for us to be championed by such an established newspaper. So go on, grab a cuppa, read our article and order your Christmas turkey with us this year – but you better be quick, order deadline is Tuesday 16th December! ← Money back on your Christmas turkey!